Dental Implants, Fixed Partial Dentures & Your New Smile! How Your Dentist in Kalamazoo Can Help Your Smile. Dental implants are the most innovative, revolutionary method to replace missing teeth. They can replace a single or multiple missing teeth and they can also support a removable appliance like a denture or a partial. They are stable and permanent because they fuse with the surrounding bone, becoming embedded in your jaw. Because they are fixed, they are also more convenient because you never have to remove them, and you clean them just like your natural teeth. Dr. Mark Richardson, a Kalamazoo, MI family dentist, wants to share how dental implants, combined with fixed partial dentures, can restore your smile. You can have full chewing function, allowing you to eat the foods you love and a beautiful smile which you will be proud to show to the world. Your restored smile begins with a simple in-office procedure during which your dentist will place one or several dental implants in your jaw. Over time, your bone will fuse around the implants, locking them in place. The dental implants function as the “roots” of your missing teeth. Depending on how many teeth you need to replace, the dental implants will be capped with permanent crowns, fixed partial dentures, or full dentures. The result is a restored, fully functioning, beautiful smile! Dental implants and fixed partial dentures can also make you look younger because they help conserve the bone in your jaw. Removable dentures or partials can cause your bone to diminish because they put pressure on your jaw. 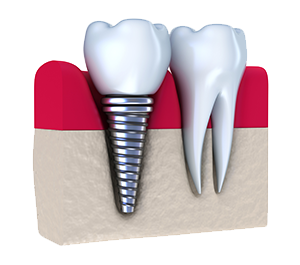 Dental implants actually help build more bone to fuse around the implants. This means you can retain your firm jawline and the youthful contours of your face. Dental implants have a success rate of over 95 percent, the highest of any surgical implant! Isn’t it time you found your new smile, with dental implants and fixed partial dentures? Call Dr. Richardson at Mark E. Richardson DDS in Kalamazoo, MI today and begin your journey towards a new smile! Call the Kalamazoo, MI office of Mark E. Richardson DDS today at (269) 343-6907 to learn more and schedule a consultation!